Are you an Android phone user and want to add some cool effects on your clicked images. You can do this easily with Pho.to Lab android app, there are so many apps are available in the market which do the same, but Pho.to Lab app is one of the best. Pho.to Lab is a split of over 450 unique effects such as multiple comic pictures creation, backdrops, photo montages, virtual picture postcards, mashups, mosaics, beautifully framed photos, animations, jigsaw and coal & paper filters and many others.The app is easy to navigate thanks to gesture-based interface. In simple words with the help of this free app you can design your photos by adding frames and special effects so easily. If has lots of features which help you to add cool effects on your image and it allows you to share your creation through MMS or e-mail and can also socialize the final image via Facebook or Twitter. 1- Photo Montages allows automatic face detection, so you can turn yourself or your friend into Darth Vader, Rambo. 2- Photo Effects. With the help of this feature you can put your photo on famous international magazine cover page. 3- Photorealistic Effects put your face onto museum walls, a soccer fans banner, in a hot off the press newspaper; airbrush yourself on exclusive cars or leave your face as a sand imprint on the beach. 4- Photo Filters includes neon glow, fire, jigsaw puzzle, pencil drawing and more. 5- Collages is best and unique way of combining different photos in one. 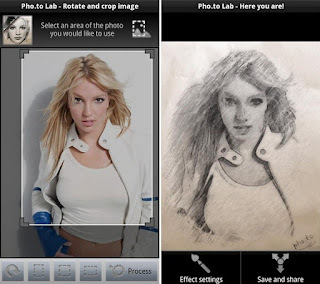 Pho.to Lab android is one of the best free app for android users with huge collection of photo templates, photo effects, montages and more.